Can You Be Alone With Yourself? Ask yourself, can you spend time alone with just yourself and your thoughts? Can you be content with evenings in relaxing with a good book or movie and your own company? Or do you struggle with finding things to do to keep your mind occupied during alone time? Does the quite bother you? Do you need to spend time with other people? Do you need to interact with a significant other to feel happy and fulfilled? Do you struggle with self-intimacy? What is Self-Intimacy and Why is it Important? According to Psychology Today, self-intimacy is all about taking time alone to reflect upon who you are at your core. You’ll need to spend some time asking yourself who you are, where you’ve been, and where do you want to go in life. Taking the time to stop lying to yourself, to take down the mask you show the world, to let down your guard will help you to acknowledge the fears that limit you and the beliefs that hold you back. This time for self-intimacy is invaluable. Especially when this time is taken at the ending of an intimate relationship. When you spend this time alone you’ll be reflecting and thinking an awful lot. Journal your thoughts and feelings, create a mind map of your goals, list out your perceived limitations and ways to conquer them. Most of all, learn who you are, what you want in life, and where you want to go. This is where talking to a coach is helpful! Life coaches, manifestation coaches, and relationship coaches all help you create a life and relationships you love! I can help you create a relationship with yourself that you’ll love! Click here to email me. Well, it’s true. If you aren’t happy with your own life as it stands right now, if you aren’t happy with your own inner landscape, then no one person is ever going to make you happy. And besides, it’s not anyone else’s responsibility, either. So how does this all important alone time make for better relationships? Well, once you spend time alone with yourself, figure out who you are and where you’re going, figure out how to be happy within yourself you’ve become a pretty whole person. Meaning you don’t NEED someone. So when you meet someone you can make a decision to add them to your life because you WANT to. This can mean adding a friend or an intimate partner. You’re making a decision to add this person to your life rather than using them to fill a hole. And, ahhhhh, that is such a great feeling! So empowering! The self reflection and the self care and the self intimacy all culminate to improve your relationship through connection. This can lead to deeper conversations, better communication, deeper emotional intimacy and ultimately a happier relationship. JoyWork Suggestion: Spend some time alone each morning after rising to write in your journal. What do you want to create that day? What challenges are you having in your life? What do you want your future relationships to look like? We are a participant in the Amazon Services LLC Associates Program, an affiliate advertising program designed to provide a means for us to earn fees by linking to Amazon.com and affi-liated sites. This entry was posted in Emotional Intimacy, Healthy Relationships, Self-Care and tagged Alone Time, Communication, Connection, Emotional Intimacy, Healthy Relationships, Relationships, Self intimacy, self reflection, Self-Care, Well-being. Bookmark the permalink. I really need to be alone from time to time and have always been pretty good at it though not for too long. I think for some people it’s extremely difficult to be alone which probably means there are some underlying issues that need to be fixed before a healthy relationship is possible. I, too, need more alone time than most women I know. For certain I need more time alone than my partner does. 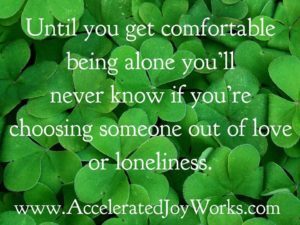 I have found, through working with many of my clients, that when you struggle with being alone there is indeed something underlying that. Some of my clients are learning that the relationship they have with themselves is the key to happy relationships everywhere else. It isn’t always something that needs fixing, though. One of my clients grew up in a rather large family surrounded by siblings and extended family. She rarely had a moment to herself. This is perfectly normal to her. I think it all boils down to some introspection, self care, and deciding how much space and time alone you need.